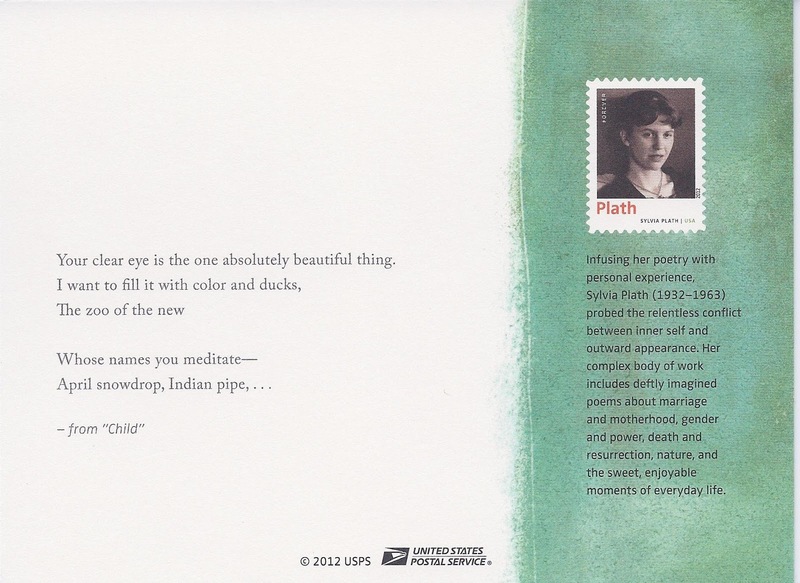 In April 2012, Sylvia Plath was honored with other Twentieth century poets with a Forever Stamp by the United States Postal Service. 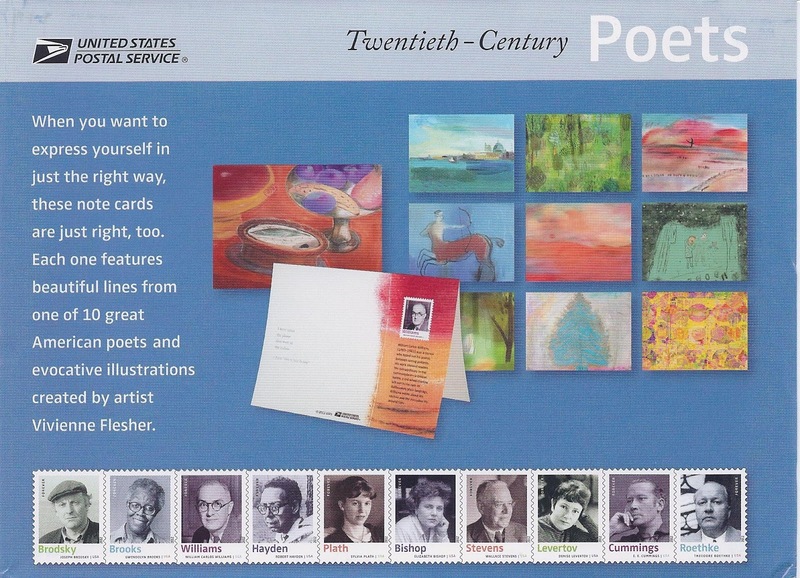 At the time, I did not know that the USPS released (or would also release at a later date) a set of collector's note cards as an attractive boxed set. 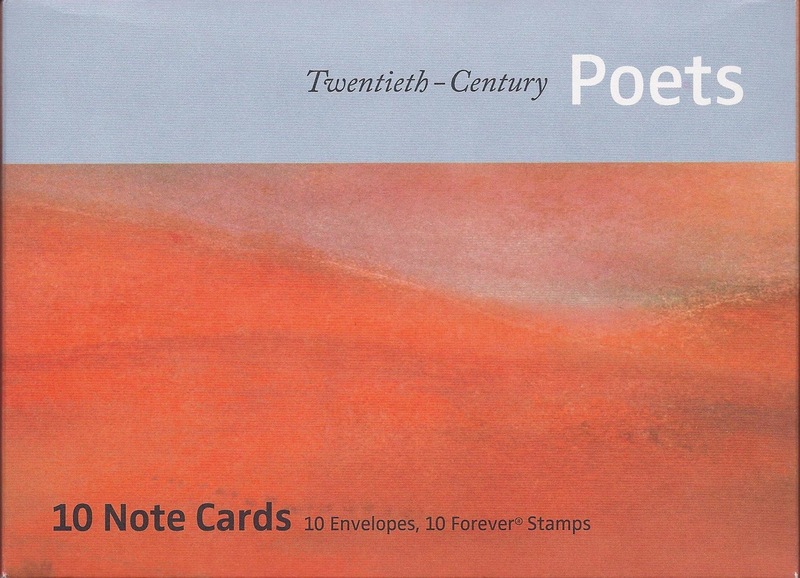 The set also includes envelopes and a set of the ten Twentieth century poets forever stamps. Each of the cards in the set features an artist's response to a poem by the featured poet. Below are the front and back of the note card, which is blank on the inside. The note card set is available for sale at many local post offices as well as online. A month ago I was in England and took this video of the churchyard of St. Peter's in North Tawton and of Court Green. I apologize for the awful video quality; the settings on my camera were not set very high unfortunately. As the video progresses, I walk towards the "wall of old corpses" ("Letter in November") -- (also known as "a row of headstones" ("The Moon and the Yew Tree") -- and get a shot of Court Green, with daffodils abloom. 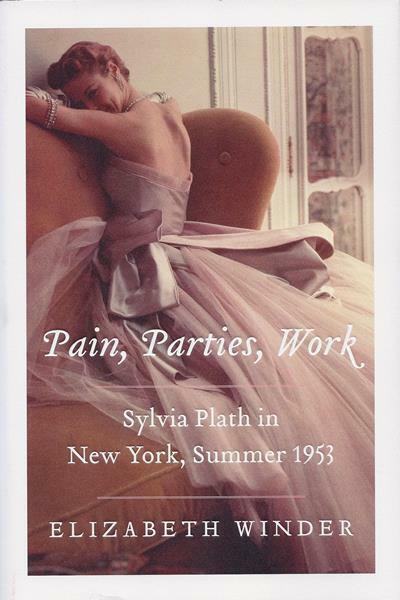 In Pain, Parties, Work: Sylvia Plath in New York, Summer 1953 (HarperCollins, 16 April 2013), Elizabeth Winder has approached a pivotal period of Sylvia Plath's life in a novel way. 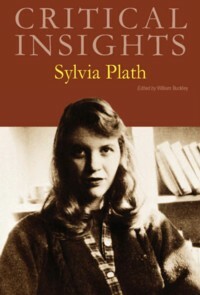 Similar to the ingenuity in scope of Andrew Wilson's recent biography Mad Girl's Love Song: Sylvia Plath and Life Before Ted, Winder writes primarily on a snapshot period of Plath's life and weaves together a short, quirky narrative based on archival research, information obtained from books, and new interviews with Plath's fellow guest editors. I was curious how one would write a 265-page biography based on one month/one summer of Plath's life. October 1962, I could see: there is a fair amount of information about this period and certainly enough creative work to really bring that aspect in as well. But, June 1953 there is less material available: very few letters, sparse journal-writing, no creative writing (other than possibly copy Plath wrote for the Mademoiselle issue). The bulk of the book is structured week-by-week (First Week, Second Week, etc. ), which is a brilliant way to approach the events; and within each chapter there are sections which break down quite nicely into manageable, readable bits of writing. There are additional chapters too, that widen the context from just Sylvia Plath in June 1953 such as "Sylvia Before," "The Issue," and "Aftermath" to name a few. "Sylvia Before" is one of the more successful chapters of the book: in particular the sub-content in this chapter such as "Field Trip" (and the sub-sub content "Vitals") and - the best of them all - "A Dictionary of Adolescence." This is Pain, Parties, Work is at its best. The chapter "The Issue" is a short, intense look at the the August 1953 Mademoiselle: and bravo to Winder for such an examination. Salient details were also to be found in "Aftermath." Scattered throughout each chapters are boxes of quotes, memories, and other information. These sidebars contain contextual, supporting information, quotes and other information, but occasionally disrupt the flow of the text. As such, I was never quite sure whether to read the boxed off material in the flow of the narrative or as separate side-bars. There are many reasons to buy this book, not the least of them being for the perspectives of, Sylvia Plath, Mademoiselle, and 1950s style, fashion, and culture that her survivors give, as well as the snippets of new information. A natural way to approach this book is from the lens of Plath's portrayal of these events in her novel The Bell Jar. Reading Pain, Parties, Work will require a significant wiping clean of preconceived ideas about what you think you know about some of the people and events from those 26 days in June that Plath manipulated for her book. Certainly some of what Pain, Parties, Work reveals about Sylvia Plath's "queer, sultry" month is mind-blowing. The most important scene to me was the event at the Forest Hills Tennis Club (now the West Side Tennis Club) in Queens. An absolute revelation. Like Plath's novel, Winder freely intertwines significant experiences from other years of Plath's life into the text. In The Bell Jar, we are drawn to Esther Greenwood's story of isolation and disappointment and depression and the inequality and double standards of 1950s America. Likewise and more importantly, we are also drawn to Sylvia Plath's experiences and emotions from the time. Esther Greenwood tells us in the opening chapter of The Bell Jar that she was "supposed to be having the time of her life" (The Bell Jar, 1963, 2). What Winder has done in Pain, Parties, Work is to show that as Plath's fellow guest editors "shared their memories of June 1953, I realized that the difficulties Sylvia endured were not unique, but part of a larger crisis--being an ambitious, curious girl in the 1950s" (Author's Note xi). It goes to show that living the dream has consequences and that feeling of emptiness and of "moving dully along in the middle of the surrounding hullabaloo" was not restricted to just Sylvia Plath (The Bell Jar, 3). About the end of the internships, Guest Editor Laurie Glazer says it best: "We dispersed in different directions to have our letdown alone" (Winder 221). And this is part of the power of both Plath's story and of The Bell Jar: that there is a universality to it to which people connect with on what seems to be a molecular level. Winder did her research, particularly with the fashions that were out that June, as well as things lost to me such as lipstick color, bra-designs (mind you, I do have an interest in this but possibly for different reasons), perfumes and other - dare I say - feminine things that had a profound meaning and influence on the 1953 version Sylvia Plath. I appreciate having the information now. The images in the book, though grainy, are relevant, but based on some of the memories recalled, the opportunity to present fetish items like the bathrobe Plath traded to Janet Wagner (aka Betsy/Pollyanna Cowgirl) was passed up. And, do any of the Guest Editors that year still have either the plastic starfish sunglasses case or the book of Ernest Hemingway short stories given to those who suffered from ptomaine poisoning? To sum: Pain, Parties, Work: Sylvia Plath in New York, Summer 1953 is an easily digested book with fascinating new facts and memories of Sylvia Plath. There is no excuse not to read Elizabeth's Winder's Pain, Parties, Work: Sylvia Plath in New York, Summer 1953. In addition to being available in print (which is the best medium) Pain, Parties, Work: Sylvia Plath in New York, Summer 1953 is also available on Kindle. 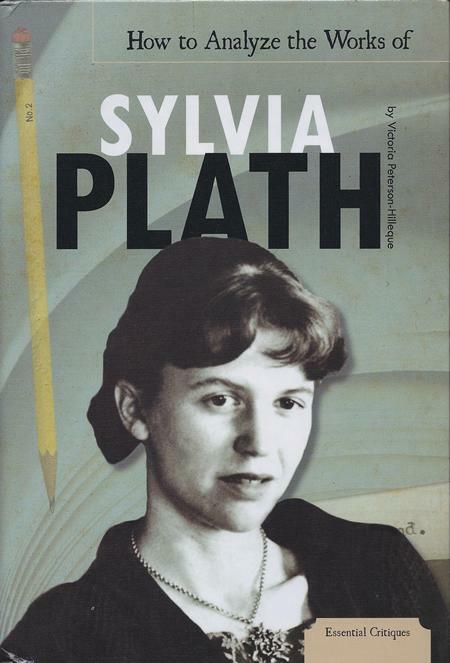 "Outstanding, in-depth scholarship by renowned literary critics; great starting point for students seeking an introduction to Plath and the critical discussions surrounding her work. 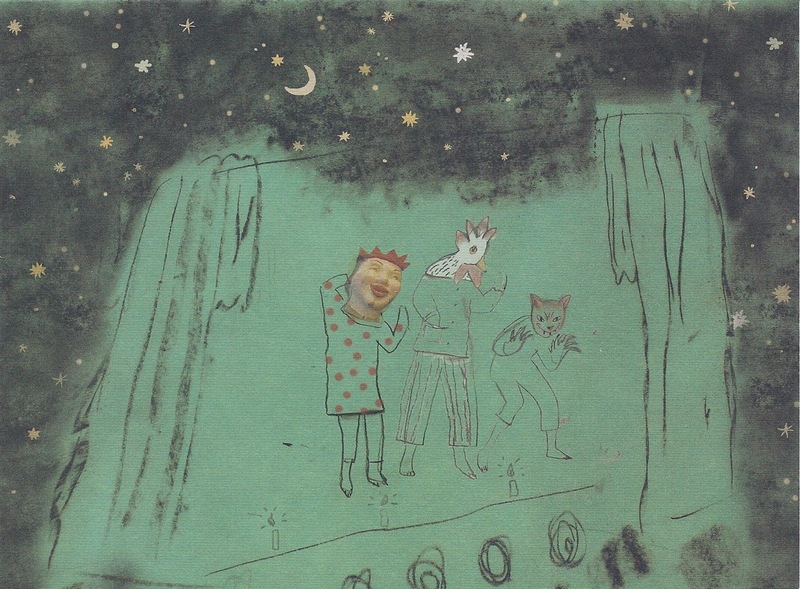 "Talented from the very beginning of her life, Sylvia Plath published her first poem at the age of eight in the "children’s section" of the Boston Herald. She said of her childhood: "I want to work at putting together the complex mosaic of my childhood; to practice capturing feelings and experiences from the nebulous seething of memory and yank them out into black-and-white on the typewriter." 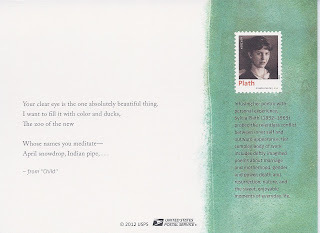 Plath won several major prizes in writing and scholarship and her poems are considered today to be the most famous by an American female poet of the 20th Century, especially those in her 1965 collection Ariel. In 1981, Plath’s Collected Poems was awarded the Pulitzer Prize for poetry, the first American poet to win this prize after death. "Edited by William Buckley, this volume in the Critical Insights series presents a variety of new essays on the unconventional American poet. This work will introduce Sylvia Plath to high school and college classrooms. Such introductions are usually conventional: biography, summary of works, and the author’s "place" in the history of American literature. This title provides such information. Yet, there is nothing "conventional" about Sylvia Plath. She is a unique, rare, rebellious and unexpected voice in American literature. "Rounding out the volume are a chronology of Plath's life and a list of her principle publications as well as a bibliography for readers seeking to study this fascinating poet in greater depth. "A chronology of the author's life, A complete list of the author's works and their original dates of publication, A general bibliography, A detailed paragraph on the volume's editor, Notes on the individual chapter authors, A subject index." I am not sure of all the contributor's to the book, but can say that three of the contributors are Gail Crowther, Jess McCort, and myself. Congratulations Bill and all the contributors. UPDATE: 16 APRIL 2013: You can view the Table of Contents here. This is another review that I started ages ago and only recently uncovered. Not that it is worth publishing as it is in itself a poorly written review about a poorly written book: a reflection perhaps of the work itself... I have two reviews in the works as well, of Elizabeth Winder's Pain, Parties, Work: Sylvia Plath in New York, Summer 1953 (HarperCollins, 2013) and Marianne Egeland's Claiming Sylvia Plath: The Poet as Exemplary Figure (Cambridge Scholars Publishing, 2013). Adbo Publishing Company published How to Analyze the Works of Sylvia Plath by Victoria Peterson-Hilleque recently (978-1617834578). It is a slim volume geared toward students in grades 6-8 and features chapters which discuss Plath's life, The Bell Jar, "Daddy," "Lady Lazarus," and "Three Women." Two chapters examine each of Plath's works and are structured with one chapter being an "Overview" and the second applying different critical approaches to the work. It works out like this: The Bell Jar (Biographical criticism); "Daddy" (Psychoanalytical criticism); "Lady Lazarus" (Feminist criticism); and "Three Women" (Structuralism). The "How to Apply" such-and-such criticism to the work are written like an essay might be written, with thesis points and conclusions, etc. Their merit as being well-written or as representative to what a teacher might expect from a student is not for me to judge. The content of the book is mediocre at best and I think that is being kind. It is victim of a poor understanding of Plath by the author and series editor; as well, there are questionably relevant illustrations and captions, and a fairly poor section in the back matter in particular the bibliography and resources. p. 16: The Harvard summer school course to which Plath was rejected was taught by Frank O'Connor not Frank O'Hara. p. 17: Hughes was not well known when he met Plath in 1956.
p. 20, caption: The photo on this page shows Ariel, Birthday Letters and Crow. The caption reads, "Plath would never see much of her work published. Ariel was published in 1965, two years after her death." That the photo shows two books by Ted Hughes makes no sense. Ladies Day, not the Ladies Home Journal, hosted the luncheon. Again, it is unclear who is responsible for the "essays" in these "How to Apply" chapters: one might presume that it is Peterson-Hilleque. p. 43: "Plath writes in her journals about Norton seducing a waitress while he was dating Plath, which is something Buddy also did to Esther." Actually, Buddy claims that it was Gladys, the waitress, that seduced him. Chapter 6: How to Apply Psychoanalytic Criticism to "Daddy"
p. 61: Otto Plath died in 1940, not 1943. By contrast, his death year is correct in the timeline on page 98. Chapter 7: An Overview of "Lady Lazarus"
p. 66: Photograph of a scan of Hughes' "Last Letter" completely out of context. p. 102: Plath's journals are not listed as "Important Works" and I beg to differ. Actually I do not need to beg; I just differ. p. 104: Plath's 1982 abridged Journals are cited in the text, but the Karen V. Kukil unabridged edition is listed. Why the differentiation between works appearing in the Bibliography and in the Resources? Simply baffling. Plath Profiles 6 is now closed for submissions and judging from the submissions the journal has received, it will not be considering late submissions this time around. Sorry. The Editorial Board thanks you for considering Plath Profiles for your work. In a move to streamline production of the journal and avoid persistent headaches and formatting problems, as of the next volume Plath Profiles will no longer accept submissions originated from an Apple product. This has nothing to do either with the recent grant they were awarded jointly by Samsung and the Bill & Melinda Gates Foundation or with the fact that if you believed that hooey you got suckered: it is still the first of April, after all. Has anyone else noticed that Google News and alerts has sucked recently (for something like the last four months)? I found this story today but, as usual, was not alerted to it via email, text, sky writing, carrier pigeon, etc. 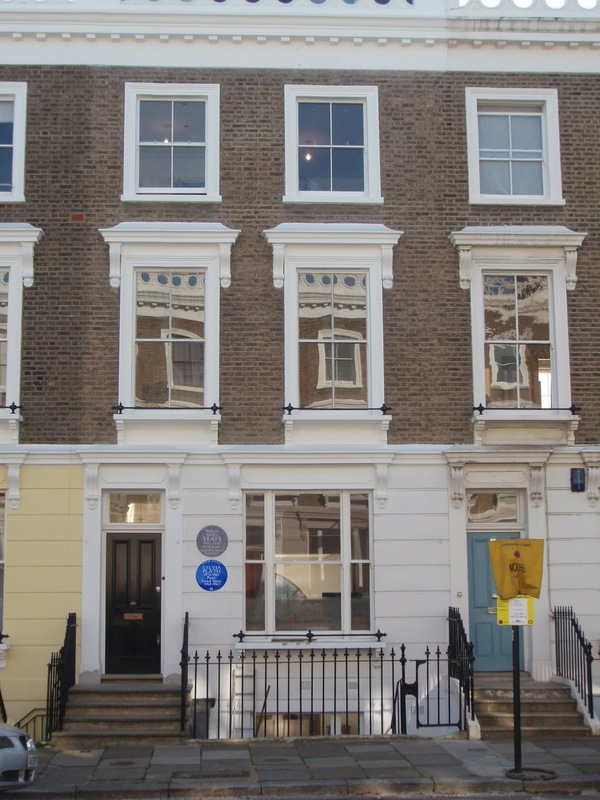 London, AP--The recent news that the English Heritage has suspended the installation of Blue plaques has lead to last ditch efforts to commemorate landmarks associated with historical figures. Small amounts of money allotted for the plaques does remain, which has led to the quiet placement of additional blue plaques around England's capital city: London. 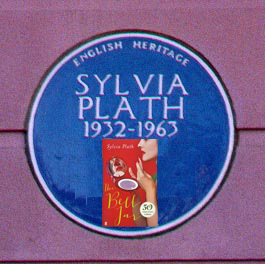 In conjunction with the recent 50th anniversary of both the publication of The Bell Jar and Sylvia Plath's death, English Heritage has installed several new, additional blue plaques in her honor in the Primrose Hill neighborhood that she loved. The first house to receive the plaque is an unusual move: 23 Fitzroy Road. Citing that some of her most starkly beautiful and original poetry was composed here, as well as a few prose pieces that are undervalued for their wit, English Heritage installed the plaque recently in a private ceremony. English Heritage did not stop there. 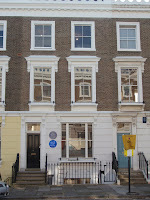 Another blue plaque for Plath is rumored to ready for installation nearby at 11 St. George's Terrace, which faces Primrose Hill, as it is generally reported that much of Plath's novel, published under the pseudonym Victoria Lucas, was written here. Plath and Hughes both used the study here on borrow from Dido "Vessel of Wrath" and W. S. Merwin, the American poet. To commemorate the achievement of The Bell Jar, English Heritage and Faber are collaborating on a plaque which will incorporate the cover image of the 50th anniversary edition of the novel, published with fanfare and furore earlier in this year.